Apparently the answer is attend Auburn basketball games, throw out the first pitch in Chicago on opening day between the White Sox and Kansas City Royals and then lead a 60-mile charity bike ride across the state of Alabama. At least those are the plans of Auburn icon Vincent ‘Bo’ Jackson. In a recent ESPN online poll Jackson was named the greatest athlete of all time, besting Roger Federer, Muhammad Ali, Michael Jordan and Jim Brown head-to-head in the tournament bracket-style voting. The poll also included Tiger Woods, Michael Phelps, Pele, Anderson Silva, Jackie Robinson, Willie Mays, Carl Lewis, Tony Hawk, Wayne Gretzky, Dale Earnhardt, and Iron Man athlete Mark Allen. In early March Jackson was spotted in the stands (and later courtside) as the Auburn basketball team took on the Vanderbilt Commodores. On April 1, Jackson was in Chicago where he was honored by the White Sox and the visiting Kansas City Royals — two of the teams for which Jackson played in the majors — and tossed the ceremonial first pitch on Opening Day. On April 27, Bo, who turned 50 November 30, will lead a one-day charity bike ride through Cordova, Alabama on the second anniversary of the deadly April 27, 2011 tornadoes. Last year’s Bo Bikes Alabama raised more than $600,000 during a five-day trek through some of the communities torn apart by these tornadoes. If you took the time to watch ESPN’s 30 for 30 special “You Don’t Know Bo” his selection as the greatest athlete of all time would be hard to argue. Even those who grew up in his era of greatness tend to forget just how jaw-droppingly amazing Jackson was. Jackson made the superhuman look simple. From his breathtaking runs on the football field to his legendary feats on the baseball diamond, Jackson was a once-in-a-lifetime performer. Still the only player ever to be named to the Major League Baseball All Star Team (1989) and the National Football League All Pro Team (1990) the video clips of Jackson running up the outfield wall, throwing out Harold Reynolds, running over Brian Bosworth and running out of the stadium on Monday Night Football are reminders of just how privileged we were to have the chance to watch in in his prime. Bo exploded onto the world stage after his Heisman Trophy winning career at Auburn. He became a global icon and the face of Nike. After his MLB/NFL career was cut short by injury, Bo built a business empire and created a life for himself and his family in Chicago. But he never left Auburn. Jackson is a regular fixture on the Auburn campus. His children attended Auburn. He delivered the spring commencement speech on campus in 2009. He was on the Auburn sidelines cheering the Tigers on during the 2010 national championship run. He was part of the search committee that helped make the decision to hire Gus Malzahn in December. In March, television cameras captured Jackson in the stands at the Auburn-Vanderbilt basketball game, just a regular fan taking in a game on campus. In April he will return to the state to help raise money and awareness. As much as any man or woman living or dead, Bo Jackson is Auburn. 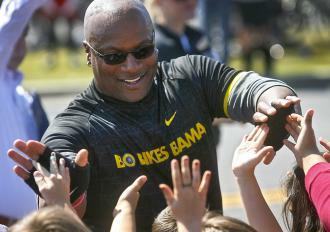 But Bo is hardly the only Auburn icon who retains a fondness for the University and its fans. Outspoken NBA Hall of Famer Charles Barkley is an unabashed Auburn fan. Even as his athletic and broadcasting career took him around the world, Barkley remained true to his Auburn roots and hasn’t passed up an opportunity to promote (or chastise when he felt it needed) his alma mater. More recent superstar Cam Newton only spent a single (albeit glorious) season in Orange and Blue. Perhaps the greatest college athlete to grace the gridiron since Jackson, and like Jackson a Heisman Trophy winner, Newton was fully embraced by the Auburn Family and he has returned that embrace with joy. The first pick of the NFL draft by the Carolina Panthers in 2011, a record-shattering rookie and All Pro selection, Newton returned to the Auburn campus this spring to work toward his degree. Just a megawatt muti millionaire regular student with a paper due. Like Jackson, Newton turned up at Auburn basketball games, a fan in the stands cheering on his team. And like Jackson he was eventually pulled from the stands to help Aubie and the cheerleaders rally the fans. Auburn is a place of legend. The greatest athlete of all time calls Auburn home. So does one of the greatest players in NBA history. So does one of the best college football players of all time and a budding NFL superstar. So does an Academy Award winner (Octavia Spencer). So does the head of one of the biggest businesses on the planet (Tim Cook, CEO of Apple). So does a Pulitizer Prize winner (Cynthia Tucker). And the founder of Wikipedia (Jimmy Wales). And a host of gold medal Olympians. And a bevy of astronauts. The greatest? Maybe it’s just an Auburn thing. Auburn will change you for the rest of your life.